The Free Cities refers to the group of nine city-states along the western coast of Easteros. They are referred to as the Free Cities because although they were part of the Valyrian Freehold, they maintained their sovereignty and were permitted local governance to rule their local affairs independently. Conversely, there were many cities of Easteros that were directly ruled by governors of the Valyrian Freehold, and as such, these cities never became part of the Free Cities. 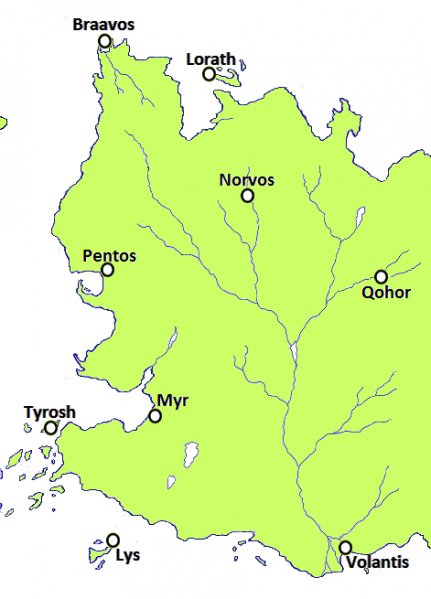 The nine Free Cities are Braavos, Pentos, Volantis, Lys, Myr, Qohor, Norvos, Tyrosh, and Lorath. Though there are many differences between these cities today, such as geography, commerce and agriculture, these cities share a common culture as all but one (Braavos) were conquered by the Valyrians and became a part of the Valyrian Freehold. Though they maintained semi-independence, they absorbed much of the language and culture of the Valyrians, which is why many of the Free Cities share cultural similarities today. Braavos is the most distinct of the Free Cities, as its history is entirely different from the other eight Free Cities. Whereas the other cities were existent and absorbed by the Valyrian Freehold, Braavos remained a secret city, its existence unknown to the rest of the world, until it revealed itself during The Doom of Valyria. When Valyria being destroyed by the Doom, the Free Cities became completely independent, no longer under any central control, which is how they exist today. Pentos is one of the wealthiest and most prosperous cities of Easteros, deriving much of its power and wealth from its geographical landscape. Pentos is a port city and engages in trade and commerce with much of the rest of the world. It is also one of the most populous cities of Easteros, though as one of the Free Cities, slavery is outlawed. Pentos is technically ruled by an elected prince, though the governing power of the city actually rests amongst the council of magisters. One of the most powerful and prosperous of these magisters is Illyrio Mopatis. Illyrio Mopatis hosted Khaleesi and her brother, Viserys, at his palace in Pentos at the onset of Season 1. Today, Varys and Tyrion have sought refuge at this same palace. Lys is another Free City that is composed of a series of islands. Lys is smaller and less powerful and commonly known for its pleasure houses. Well known figures that come from Lys include Varys as well as Salladhor Saan, a pirate friend of Davos Seaworth, who has fought for Stannis Baratheon. Volantis is the most southern of the Free Cities and therefore very closed to the cities of Slaver’s Bay. As such, it deals extensively in slave trade. The most noteworthy character from Volantis is Lady Talisa, the woman who married Robb Stark, before being murdered at the Red Wedding. Qohor is less well-known of the Free Cities, being further inland and its land full of forests. Qohor is also well known for being guarded entirely by Unsullied soldiers, a legend telling that 3,000 Unsullied defended the city against 25,000 Dothraki. A well knock character from Qohor is Locke, who came under the service of Roose Bolton and cut off the hand of Jaime Lannister, before being killed at Craster’s Keep. Norvos is another of the less well-known Free Cities, also laying further inland. It is ruled by a council of magisters, who often pay tribute to the Dothraki who frequent the city. Myr is another of the stronger Free Cities, also laying along the coast and deriving much of its supremacy from trade. The most notable character from Myr is Thoros of Myr, a priest to the Lord of Light and leader of the Brotherhood without Banners. Tyrosh is another coastal Free City that is commonly involved in trade, namely the trade of slaves. They are known for crafting fantastic armor. The most notable character from Tyrosh is Daario Naharis, who leads the Second Sons under Khaleesi’s command. Lorath is the least known of the Free Cities. For some time, Jaqen H’ghar was posing as a man from Lorath. This entry was posted in Uncategorized and tagged braavos, daario naharis, easteros, free cities, jaqen h'ghar, lys, myr, pentos, thoros of myr, valyria, valyrian freehold, volantis. Bookmark the permalink.